Come and enjoy some new games, friends and drinks! A new twist on the success of the Saturday afternoon playups — Playup Perth! After Dark — a more grown up, evening playup session where we will focus on video and table top games. Did we mention there will be a bar? 1.) Wesley Lamont’s COGZ – a steampunk themed strategy, pattern matching game. Players are aiming to build cog chains using the Game Tiles. Cog chains of the same colour earn points with completed Cogz earning bonuses and slowing the other players. High points can gain bonus actions but players must be cognisant that final scores are based on their cog colour with the least points. Recognising where ideal points can be gained, completing Cogz at the opportune time, limiting opponents and cognitively planning for future turns will challenge the most experienced players. COGZ helps you hone your pattern matching, logic, visual IQ and memory skills to enhance your own cognition in this fun strategy game. 2.) Glen Spoors’ Colossus Awakes – a strategy-based boardgame in which 2-4 players control adventurers and minions in a struggle to influence a Colossus awakening beneath the earth. Each player’s goal may be to free, destroy, subdue or survive the Colossus as it destroys all in its path. 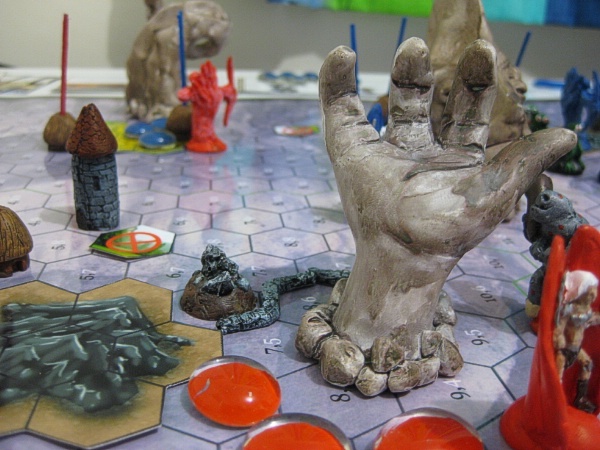 The game is played on a 20×20 hex map with custom miniatures and cards and involves a mix of rapid resource building, card drafting and skirmishes amongst and against the pieces of the Colossus as they rise up from the board. 3.) Glen Spoors’ Pocket Troll – Three boys have spotted a marauding troll but no one believes them. The boys have to bring 3 pieces of evidence to the village, while the troll has to get to the village at night (or eat all 3 boys). The game is played on an unfolded 6″ board using tokens and cards. 4.) Anthony Sweet’s Breakwater – a board game about voodoo, jazz and clockwork for up to four players. The Loa are making their annual pilgrimage to the bayou town of Breakwater, and it’s up to you to make sure there are festivities and parades fit for their arrival. Collect resources and claim the streets of Breakwater for your parades to entice the favours of the Loa, for after three days they will decide who will bear the prestigious title of the town’s new Parade Doctor. Breakwater combines a modular board and set collection mechanics, plus a novel clock market feature, that ensures each playthrough is a unique experience. More to be announced, stay tuned!